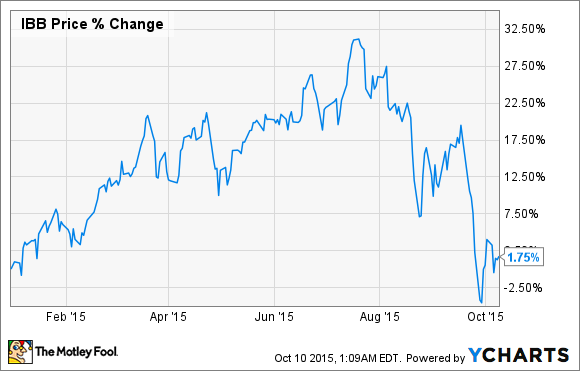 OvaScience, Keryx Biopharmaceuticals, and NantKwest have had a rough 2015. Can any of these beaten down biotech stocks rebound or should investors continue to keep their distance? Given that biotechs can rebound almost as quickly as they fell, I think it's worthwhile to consider if investors should have these three beaten down biotech stocks on their radar right now. OvaScience is a global fertility company that was supposed to have a breakthrough year in 2015. Unfortunately, M&A activity among clinics offering the company's Augment fertility treatment (only available outside of the U.S. at the moment) caused OvaScience to announce last month that it's likely to fall short of its stated target of 1,000 Augment treatment cycles for the year. Soon afterward, Wall Street predictably hit the company with a hefty downward revision for its bottom and top line expectations, helping to drive the stock even lower. On the bright side, there has been some noteworthy insider buying among the company's officers and directors over the past month, perhaps indicating that these individuals think the stock is now too cheap based on the company's future commercial prospects. After all, there is a huge unmet medical need for improved in vitro fertilization techniques in Western nations, where more and more women are deciding to delay reproduction. Meanwhile, current methods only have an average success rate of around 30%, according to OvaScience. Having said that, I find this stock to be a tad too risky for my taste, given that it's not altogether clear right now when OvaScience will be able to bring its fertility platform to the all-important U.S. market. So, until then, I think OvaScience makes for a good watchlist candidate, but not necessarily a strong turnaround candidate. Is Keryx finally approaching a bottom? Keryx's stock has been sliding ever since last December's commercial launch of the company's first approved product, Auryxia, a medicine indicated for the control of serum phosphorus levels in patients with chronic kidney disease on dialysis. Auryxia's commercial launch got off to an extremely slow start, generating only $1.8 million in sales in the second quarter and $2.2 million through the first six months of 2015. Due to the costs associated with launching a new drug and continuing its clinical activities, Keryx is facing a tightening cash position that may force the company to raise additional funds soon. The one wild card, though, is Auryxia's recent approval in the EU, where the drug may perform better due to a broader label that includes patients already on dialysis, as well as those in the predialysis stage. As a direct result of this more favorable label in the EU, the Street has Keryx's top line growing by a healthy 274% in 2016. Before shareholders celebrate, however, there are a few important issues to consider. First off, Keryx's shares are presently trading at around 8 times projected 2016 revenue. That's not exactly a compelling bargain, and this estimate may, in fact, be a rather optimistic outlook. After all, Keryx may decide to bring in a partner for its flagship drug in the EU, which would probably mean more guaranteed revenue in terms of upfront milestone payments, but significantly less upside potential. So, I'm personally waiting to see how the company approaches the drug's commercialization in the EU before picking up any shares. NantKwest's fall is certainly dramatic -- but is it deserved? Like many immunotherapy companies looking for an influx of funds by going public, NantKwest pulled the trigger on its IPO earlier this year, but with rather mixed results. Although the stock initially rose to above $38 a share -- up from its IPO price of $25 -- the biopharma's shares are now down 62% from their former highs. The good news is that NantKwest's plunging share price appears to have more to do with the market's pessimistic outlook toward clinical-stage biopharmas in general than anything specifically wrong with the company's therapeutic platform. In a nutshell, NantKwest is hoping to use natural killer cells to treat cancer, infectious diseases, and inflammatory diseases. And so far, NantKwest has launched a midstage trial to test its platform in skin cancer and is reportedly about to initiate another trial in breast cancer. All told, we don't have much insight into how successful -- or not -- NantKwest's experimental platform will ultimately be at fighting these deadly diseases. So, it's hard to tell if the market's overtly negative view of the company's valuation is warranted. 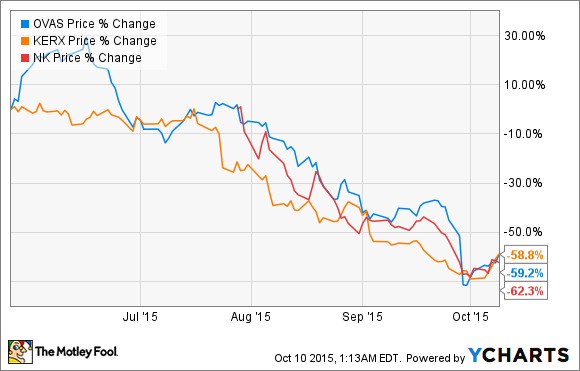 Are any of these 3 beaten down biotechs worth the risk? I like OvaScience and Keryx as watchlist candidates because their top and bottom lines could improve markedly within the next year -- that is, if things go according to plan. NantKwest, though, might be a worthwhile speculative buy for seasoned biotech investors that understand the significant risk involved with a clinical-stage company. In short, NantKwest is going after big game with its natural killer cell platform that, at least initially, grabbed the market's attention in a good way. So, given that this downward move wasn't the result of a clinical or regulatory setback, it stands to reason that this stock could quickly reclaim its former glory with a positive news release. Stay tuned.